The embattled center-right French presidential candidate Francois Fillon has delivered a spirited speech to thousands of supporters in Paris, branding those who demand his withdrawal “traitors,” but sounding apologetic over the scandals that have damaged him. “You should not surrender to worry or anger, those of you who will never give up the fight, you who always refuse to listen to the siren calls of discouragement,” the 63-year-old politician told a rain-battered crowd standing in the shadow of the Eiffel Tower. Police said 50,000 people braved the adverse weather to listen to the Les Republicain candidate who beat off challenges former President Nicolas Sarkozy and ex-Prime Minister Alain Juppe to secure the party's nomination. 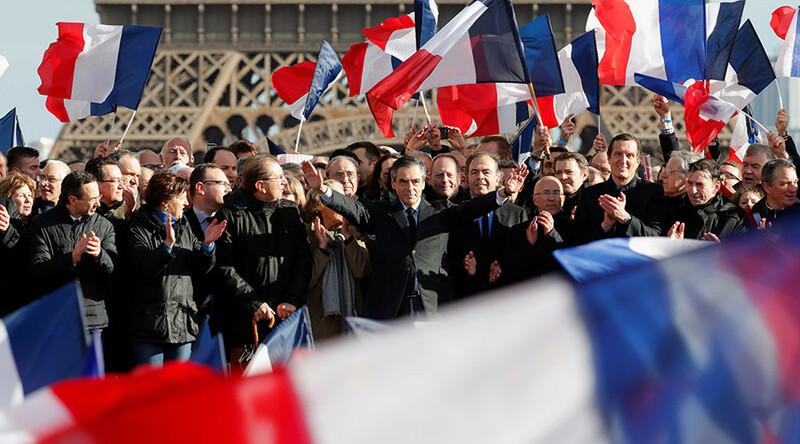 Fillon’s office, however, claimed the true number of supporters, who waved tricolors and broke into chants of “Fillon, President!” and “We will win!” was closer to the 200,000 mark. His British-born wife Penelope — the key figure in the scandal in which he's been accused of giving fake jobs to his family — was beside him. Members of Fillon's family are suspected to have earned almost €1 million in state money, for purportedly serving as his secretaries and aides, while simply pocketing the money. “I asked my wife to work for me because she knew the ground because it was convenient … I shouldn’t have done so,” admitted the candidate, before saying that he “hesitated” too long before clearing the air, once the accusations surfaced in January. Earlier on Sunday, Christian Estrosi, a senior party figure, said Fillon should be allowed to make a “dignified exit” from the race, ahead of crucial internal party talks scheduled for Monday. Juppe, who came second, has been suggested as the replacement. In an interview with France 2 after the rally, Fillon dismissed the suggestion out of hand. 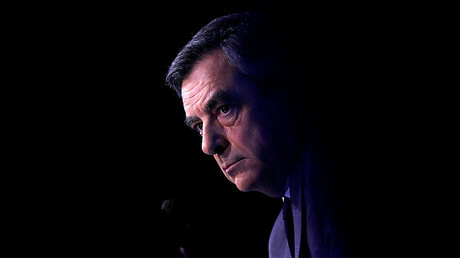 “No one today can stop me being a candidate,” declared the politician, who served as Prime Minister under Nicolas Sarkozy. Fillon does not need to come top in the first round of the presidential election in April, but he needs to be in the top two to face National Front candidate Marine Le Pen in a run-off, where he is expected to beat her convincingly. 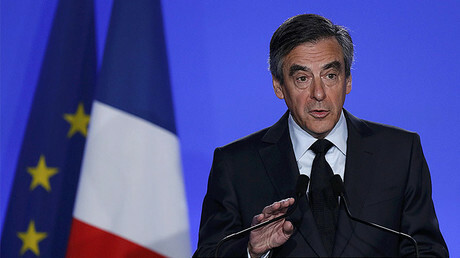 Prior to the scandal, Fillon was polling a close second to Le Pen but has since been overtaken by left-centrist Emmanuel Macron, who is also predicted to beat the nationalist candidate in any run-off. In the latest Kantar Sofres poll conducted between March 2 and 4, Le Pen is at 27 percent, Macron at 25, and Fillon on 17. In contrast, a poll conducted earlier this week showed that, if he were to stand, Juppe would make it to the run-off with Le Pen, likely securing the presidency for Les Republicains.